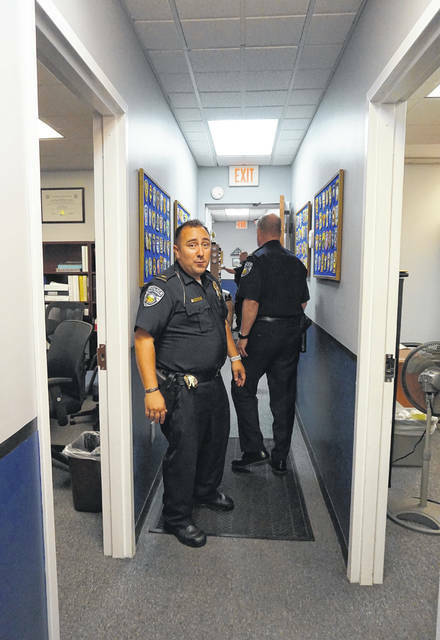 Narrow hallways are the rule at the Genoa Township Police Department building. Lt. Rich Lyon, left, and Chief of Police Stephen Gammill, right, have to turn sideways to pass each other. Wednesday, October 17, 7-8:30 p.m.
Saturday, October 27, Noon-3 p.m.
Tuesday, October 30, 7-8:30 p.m. Residents of Genoa Township are being invited to visit their local police department, which would be replaced if voters approve a property tax bond levy on the Nov. 6 ballot. The 10-year, 0.80-mill bond would raise up to $7 million to construct a new facility. According to the township, the levy would have an estimated annual cost of about $28 per $100,000 of property value. Earlier this year, a citizen’s committee recommended the building be replaced. The township trustees agreed to purchase land across the street from the current building that could be used to build a new police headquarters. Drawings have been made of the new building. The question of whether to make the upgrade is up to the voters, though. And while the Genoa Police Department can’t support or endorse the issue, it can provide factual information about the matter, and are doing so by inviting the public to check out the PD’s current home during a series of open houses. A handful of people showed up at the first open house on Wednesday. Pulling into the lot, the first thing one notices is the police department is among three buildings, flanked by the Genoa Fire Department and the township’s maintenance building. A bike trail runs between it and state Route 3. Some of the gutters appear to have weeds growing out of them before entering from a narrow lobby into a narrow hallway. Among those leading the tours was Lt. Rich Lyon. He said the Genoa PD was established in 1976, and walls were added to a picnic park shelter to create a makeshift police station, while prisoners were held in a separate building on another street. Although operations are now consolidated, the existing facility has undergone a lot of modifications in order to hold its current 30 employees, a K-9 officer, 10 cruisers and a motorcycle, which serve a population of 28,000 people over 22 square miles. Among other things on the tour, Lyon showed where the frost forms inside; the three separate places needed to store police records; the floor near his office where the carpet had to be torn out when a restroom flooded; a shared weight room with the fire station where loud music sometimes blares; and a garage where vehicles have to back out because the front entry is broken. Lyon showed a small kitchen, and said the plumbing was so bad, you couldn’t get hot water from the sink. Handles were missing on some of the cabinet drawers. Computer servers were next to an exit, lights flickered upon entering a restroom, the prisoner property room was small, and a room for questioning lacked a two-way mirror because it had been incorrectly installed. An office copier took up half the width of a hallway, and if a supply cabinet across from it were opened, one of the doors would hit the copier. Much equipment, such as the unisex locker room, seemed old. As a joke, one of the employees has placed a bandage over a crack in one of the walls of the building. “This is what we have,” Lyon said, as the tour came to a close. https://www.delgazette.com/wp-content/uploads/sites/40/2018/10/web1_DSC03451.jpgNarrow hallways are the rule at the Genoa Township Police Department building. Lt. Rich Lyon, left, and Chief of Police Stephen Gammill, right, have to turn sideways to pass each other.